successful and supportive relationships and live luscious lives. The value of understanding ourselves is not always clear in relation to how we treat ourselves, how we interact with others, or how we find our best balance in order to feel that life is fun, enriching and fulfilling. This book will resolve the issues that currently exist within the self-help industry, which focuses on individual problems and doesn't provide a comprehensive review and exploration process by which successful women can understand why they have been able to achieve career satisfaction, but not achieve optimal health, full meaning in life, or find their most supportive life partners. As a psychologist and executive coach, author Kerry Howard, also known as Ms Pink Herself, provides direction and understanding based on her knowledge of human behaviour. Her approach in this book is unique due to its semi-autobiographical nature; it is peppered with her experiences in applying this information to her own life. Kerry has made this journey herself and assisted over 500 others to do so as well. This book comes from a place of practical experience and credibility across all forms of personal transformation. Kerry provides down-to-earth advice for professional women on every aspect of the life review process from self, relationships, career, finances, health and wellbeing and spirit. Define Your Inner Diva is the answer for those women who have always wanted to be truly happy, focused on their health and satisfied in their bodies, who seek to gain a supportive partner who love and respect their unique value and contribution to the world. If you have always wanted to love your whole life, and make it an awesome existence full of fun, food and love, then this is the book for you. 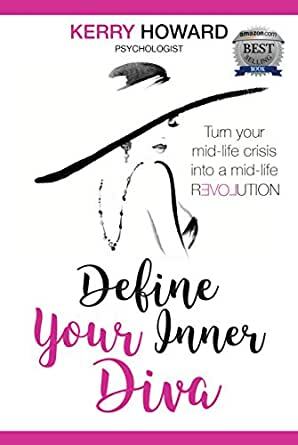 “Kerry Howard is insightful, inspirational and amazingly intuitive in understanding the ‘secret’ desires of fabulous professional women"
5.0 out of 5 starsThe book every woman must read. Kerry has the credibility and experience to address any challenge a woman can face, the humility and courage to share her story with you, and the concern for others and singular focus on helping women in any situation. This book is simply a manifestation of who Kerry is and what she stands for. This book will challenge you and even better, it provides incredible support to all women, at any age and not just singles. Although not a typical book for a man to read :-D .. I must confess I've had a peak in out of curiosity when I came across this. I can clearly see how any woman in mid-life crisis would love it, Kerry's personal stories and advice she gives comes with great wisdom and experience. 5.0 out of 5 starsHighly recommend this book to ALL women! Highly recommend this book to ALL women. This is not just another self help book! The author speaks from the heart and experience - she definitely has a passion for helping women thrive. I found the additional resources provided compliment what is an amazing read. Love this book - The author is passionate & sincere in helping women find their inner Diva. She is honest and open and a breath of fresh air. Love the book. So much of what the author talks about resonates strongly for me. May the world be filled with gorgeous Divas just like Ms Pink. An excellent book, the author is sincere and has a relatable voice for the complex issues discussed.